As a part of its ongoing expansion, the highly recognized Eastern European fighting promotion, Fight Club Berkut, has expanded its reach to include nearly a dozen Gi and No-Gi grappling events this year in six different weight divisions. 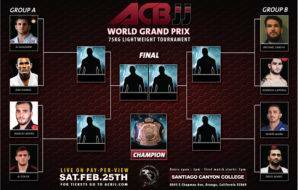 Absolute Championship Berkut Jiu-Jitsu (ACBJJ) is quickly becoming one of the most highly respected organizers of Jiu-Jitsu events and tournaments across the globe. Our mission is to attract the very best Jiu-Jitsu talent on the planet, organize the world’s most competitive Gi and No-Gi tournaments, and set the standard for excellence in Jiu-Jitsu competition worldwide! After organizing what some have referred to as one of the most elite Jiu-Jitsu fight cards ever assembled, a series of 13 submission-only matches at the 2015 2nd Berkut Jiu-Jitsu Invitational in Moscow, Russia, including a 20 minute No-Gi submission-only match between former ADCC champions, André Galvão and Romulo Barral, no one expected a card like that to ever be outdone. After all, it pitted some of the biggest names in Jiu-Jitsu against each other. 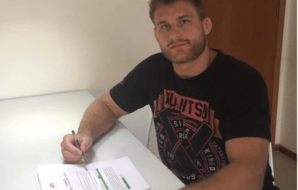 Names like André Galvão, Romulo Barral, Dean Lister, Caio Terra, Felipe Pena, Jeff Monson, and João Miyao. However, once again, held in Moscow, Russia, the 2016 3rd Berkut Jiu-Jitsu Invitational continued to impress, featuring a submission-only event and world class grapplers in another amazing display of the gentle-art. The event included an elite group of talent, including Yuri Simões, Lucas Leite, Erberth Santos, Clark Gracie, Michael Langhi, and Jackson Sousa. With these and other events scheduled for 2017, ACBJJ is creating a name for itself, as one of the fastest growing and most respected organizations to watch in Jiu-Jitsu competition around the world. 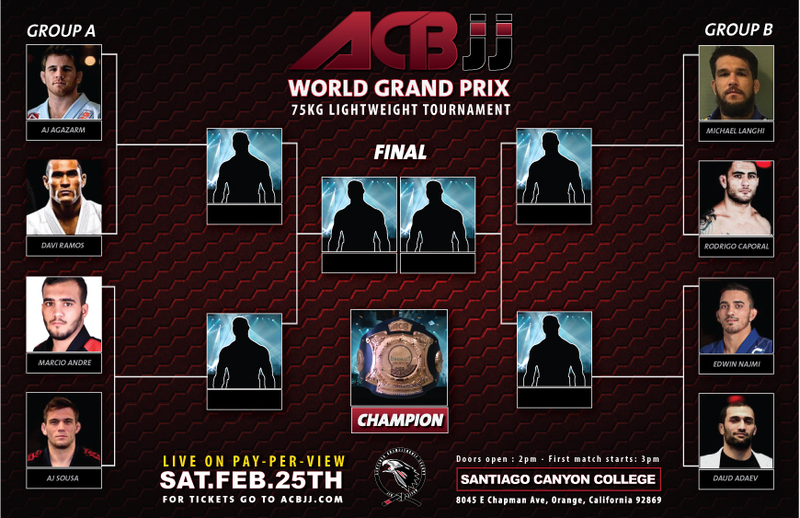 ACBJJ GRAND PRIX / SANTIAGO CANYON COLLEGE – ORANGE, CA. 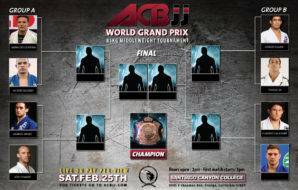 Once more ACBJJ is raising the bar as we prepare for our 1st ACBJJ Grand Prix event in the United States, the upcoming ACBJJ GP, scheduled for Saturday and Sunday, February 25th and 26th. Our venue for this card will be the campus of Santiago Canyon College, in beautiful Orange, California. This event promises to be one more spectacular display of talent, featuring some of the most prestigious and up and coming Jiu-Jitsu players from around the world. 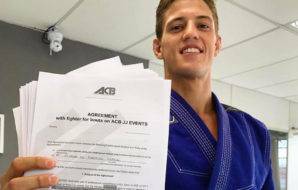 Including names like, Michael Langhi, Davi Ramos, Rodrigo Caporal, AJ Sousa, and Márcio André, not to mention, a very likely battle between two teammates, the Americans, Edwin Najmi and AJ Agazarm, both from Gracie Barra. Beginning on Saturday, the 75kg (165.3 lbs) and 85kg (187.3 lbs) categories promise to showcase some of the top Jiu-Jitsu talent from across the globe. In addition to some of the best up and comers, we can look forward to seeing World Champion, Pan American, and European Open Champion, the American black-belt under Romulo Barral of the Gracie Barra Academy, Edwin Najmi display his submission oriented style on the mats.